The US economy ended a tumultuous week with disappointing news. 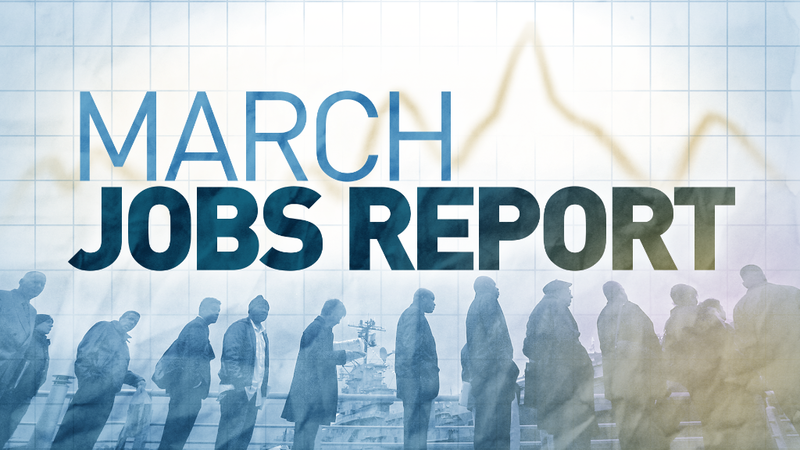 America added 103,000 jobs in March, slower than previous months and well below expectations. Economists had predicted 185,000 jobs. The unemployment rate stayed at 4.1%, the lowest since 2000. It has come down steadily from a peak of 10% in 2009. Wages grew 2.7% in March compared with a year ago, in line with expectations. Wage growth is one of the few yardsticks in the job market not to pick up meaningfully in recent years. Job gains for January and February were revised down by a total of 50,000 jobs. The job figures come as concern grows about a trade war between the United States and China. President Trump said Thursday he is considering hitting China with tariffs on $100 billion more of its goods, for a total of $150 billion. Responding to Trump's first round of proposed tariffs, Chinese officials earlier this week announced they would apply tariffs on $50 billion of US exports to China. Separately, Trump has already imposed a 25% tariff on imported steel and a 10% tariff on imported aluminum. The tariffs apply to most nations, though Trump has granted exemptions to six nations and the European Union. Economists say it's unlikely the trade concerns contributed to the slowdown in job growth. The Labor Department does its monthly surveys around the 12th day in every month. The United States didn't start to signal tariffs on China until late March. The steel and aluminum tariffs were announced earlier in the month. But the companies that could be hurt by those, such as auto manufacturers, make up a small slice of total jobs. "The impact of that is going to take months to be felt," said Robert Frick, chief economist at Navy Federal Credit Union. In the entire job market, "you're not going to lose 100,000 jobs because of people not adding [jobs] to steel and aluminum mills." 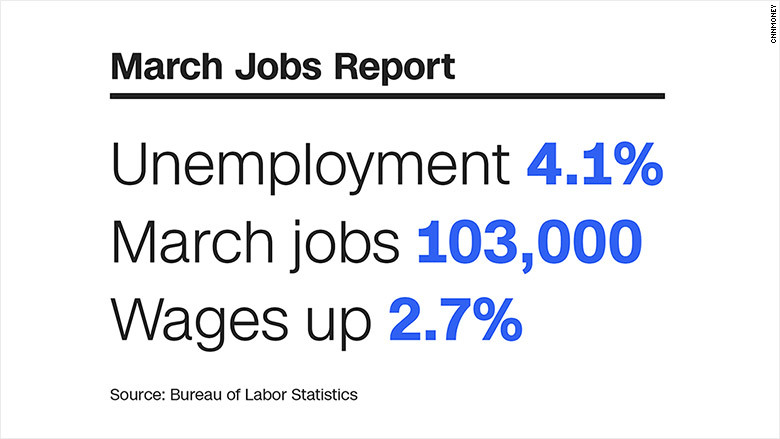 The job news still reflected a healthy economy overall. March was the 90th consecutive month of job gains, extending the longest streak on record. In general, job growth is expected to slow down as unemployment remains very low. Jobs were not added across the board, as they were in previous months. Manufacturing and health care industries each added 22,000 jobs in March. Business services gained 33,000. But retail businesses shed 4,000 jobs and construction companies lost 15,000 workers after going on a hiring spree in February. Experts say the pullback in job growth could be blamed partly on cold weather in March and the much stronger job growth of 326,000 in February. It's not unusual for job growth to slow after a surge the month before. "The US economy is still maintaining a healthy pace of expansion," said Sam Bullard, a senior economist at Wells Fargo.